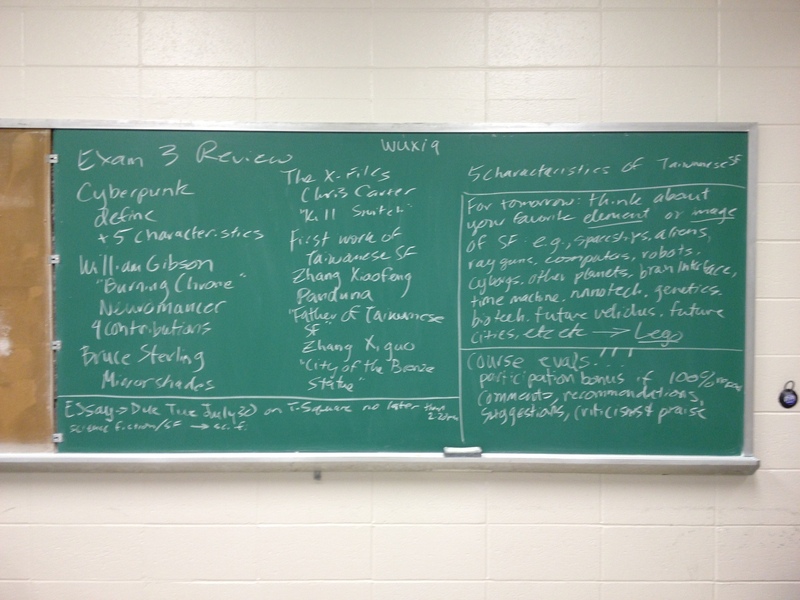 Taiwanese SF lecture notes on the chalkboard. 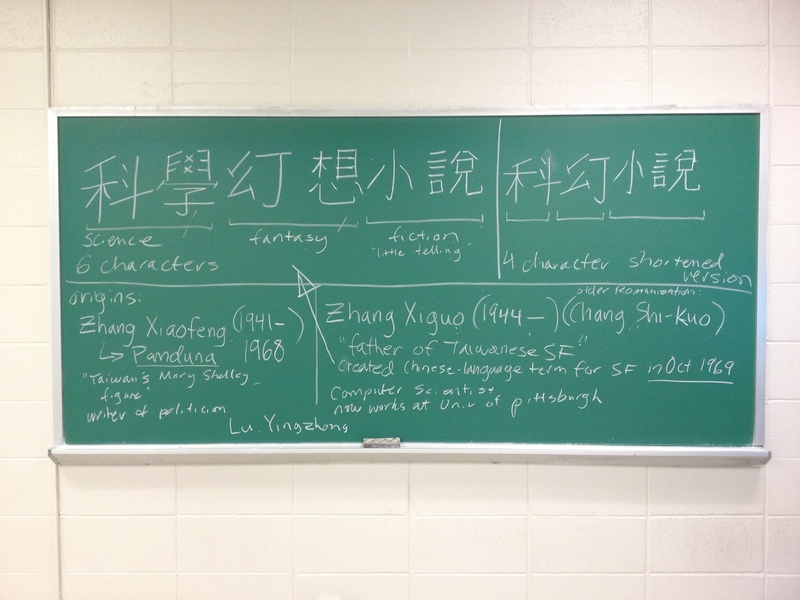 In today’s lecture, I charted a brief history of China and Taiwan (revolution, Kuomintang/Republic of China, Civil War, and diaspora to Taiwan), the history of Taiwan SF with an emphasis on Zhang Zioafeng’s “Panduna” as the first Taiwanese SF and her role–like Mary Shelley’s–as the “mother of Taiwanese SF” and Zhang Xiguo’s as the “father of Taiwanese SF” who also coined the term for “Science Fantasy Fiction” (科學幻想小說: Science/科學, Fantasy/幻想, Fiction/小說). I also identified five general characteristics of Taiwanese SF: 1) Synthesis of Western and Eastern culture, 2) Wuxia (武俠) or the Chinese martial arts chivalry story, 3) Adopt Chinese mythology and history to make the reader more familiar with the fantastic elements of the story (c.f., Star Trek), 4) Themes of nostalgia and loss, and 5) Conservative affirmation of society and the existing social order. During class, I led the students through two exercises. After explaining to them the general characteristics of reading and writing in traditional Chinese, I handed out worksheets for them to practice writing the four characters of the truncated term for “Science Fantasy Fiction” (科幻小說). I gave them about 5 minutes to try out their Chinese penmanship while I walked around watching their progress. This also led to a discussion about how written traditional Chinese is different than Japanese (kanji, hiragana, and katakana). In the second exercise, I divided the class into four teams of three students each. I handed each team two pages from the John Balcom translation of the Prologue to Chang Shi-Kuo’s City Trilogy (which corresponds to the “City of the Bronze Statue.”) The students were tasked with identifying differences between the two translations. They discovered small variations in measurements, descriptions, and phrasing. In particular, they noticed that the two translations differed in tone–the translation on his website is more vernacular and the book translation has a more formal tone. However, they reported that the Bronze Statue seemed more life-like and personified in the Balcom translation. I was surprised though that they did not pick up on the understated comedic tone in either translation. Nevertheless, I was glad that they got to experience first hand how much of a role the translator has in the creation of a translation–translation being a creative act itself. At the end of class, we reviewed for their short third exam tomorrow and I talked with them about the fun Lego project that I have planned after the exam. Their final essays in the class will be due next Tuesday. Many thanks to Yufang for helping me with my research, writing, and pronunciation for this lecture!